The male Carpet Chameleons are largely green and females are heavier-bodied and have a wider range of colours, including bands of white, yellow and orange. Both sexes have stripy throats and lips. They can change their colour depending on their mood and environmental factors and they usually start the day with a dark colour to enable them to warm up rapidly by exposing themselves to sunlight. Screened enclosure – Minimum dimensions 0.4 x 0.4 x 0.5 meters (1.3 x 1.3 x 1.6 feet), preferred dimensions 0.4 x 0.4 x 0.7 meters (1.3 x 1.3 x 2 feet). Live plants are preferred for this species to provide cover as well as increased humidity within the cage. Small ¼” diameter sticks should be placed horizontally within the cage to provide resting areas and basking areas. They typically bask throughout the day but at times will retreat into the vegetative cover so both open basking areas as well as shaded hiding areas are a must. Multiple open basking locations around the top of the cage are recommend in order to provide different heat/UVB gradients. None. Female Furcifer lateralis will require a laying bin for depositing of eggs. This bin should contain 0.15 – 0.20 meters (0.50 – 0.65 feet) of a sand/soil mixture and be placed within the cage. Basking and UVB are both required. For lighting I recommend HO T5 double fixtures with 6% Arcadia UVB bulb and a 6.5k Daylight bulb. Basking areas should be separated from the UVB area and have a temperature between 29 – 31 ºC (85-88 ºF). Ambient temperatures of the cage should remain in the range of 23-25 ºC (74-77 ºF) during the day and drop to 20-21 ºC (68-69 ºF) at night. Lights should be set to run on a 12 hours on , 12 hours off cycle. 5-15 minute mistings 3-4 times a day is ideal. Shorter misting times are acceptable but at a minimum their cages should receive 2-3 mistings a day for a period of 1- 2 minutes each. The cage should have time to dry out prior to the lights going off for the night. Ambient humidity ranges from 50-60% with spikes after misting up into the 90%s. Night time humidity should remain as high as possible. Feed 6-7 days a week. Smaller feeders are preferred such as crickets, bean beetles, fruit flies, and house flies. All feeders should be properly gut loaded as well as dusted with calcium supplements. Being a smaller species handling isn’t recommended. They will tolerate it for short periods of time but overexposure should be avoided. Spot cleaning daily is required. Once a month or every other month the cage should be cleaned from top to bottom. It occurs approximately once a month. No ad is necessary, humidity and misting are sufficient for shedding. 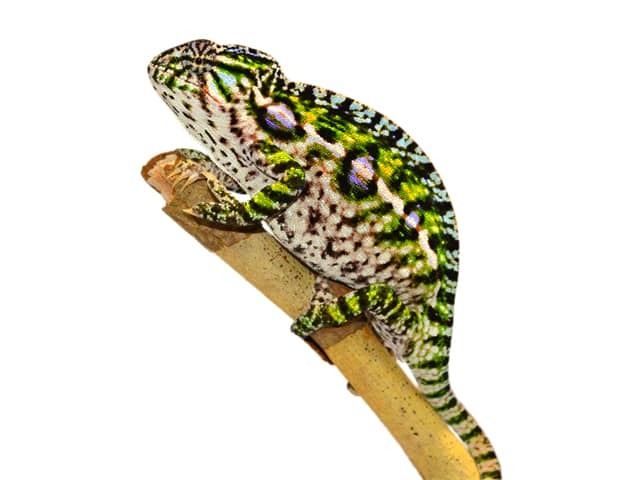 Furcifer lateralis are susceptible to common health issues related to chameleons. These being upper respiratory infections, general infections, egg binding and stress related issues. All of these issues can be prevented with proper care and husbandry but should any of them arise a trip to the vet for proper diagnosis and treatment will be required.